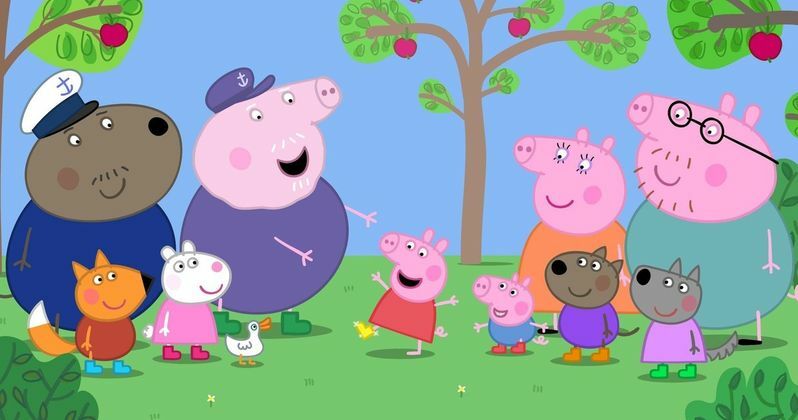 Peppa Pig is massively popular in China, with two theme parks set to open in 2019. It has now been confirmed that Entertainment One and China's Alibaba Pictures are working on a movie to be released during 2019's Chinese New Year, which will coincidentally also be the Year of the Pig. This news comes after the children's character was scrubbed from numerous Chinese websites for promoting an anti-social influence after a subversive Chinese online subculture began to use the image in ways that weren't always family-friendly. Peppa Celebrates Chinese New Year is a full-length, live action-animation hybrid movie, which is scheduled for release in China on February 5th, 2019. The storyline of the film was written to directly correlate with the upcoming Chinese New Year and incorporates some of the hallmarks of the celebration including dragon dancing, dumpling wrapping, and putting traditional Chinese costumes into the movie. The Peppa Pig movie will also introduce new characters, the Panda Twins. Wei Zhang, president of Alibaba Pictures recently talked about the importance of Peppa Pig in China and the rest of the world. Zhang spoke about what makes the original series so popular and his excitement to introduce Chinese culture into the franchise. The Alibaba Pictures president also hopes that the Chinese New Year-themed movie will get gain a whole new generation of fans. He had this to say. "This cooperation is an important opportunity to promote cultural exchange between China and the West. Alibaba Pictures is excited to share China's traditions and culture with the rest of the world with a new fun filled storyline featuring a character as popular as Peppa. The Peppa Pig series emphasizes the importance of family values, and that is something that will deeply resonate with Chinese audiences. We hope this family film will pave the way for further development of films for young audiences in China." Entertainment One's Olivier Dumont, President Family & Brands, also spoke about the exciting new partnership to bring Peppa Pig to the big screen for Chinese New Year. In addition to the film, the merchandising aspect will be huge, Dumont mentioned. 2019 is going to be a huge year for the Peppa Pig franchise. Dumont explains. "There is a huge fan base for Peppa Pig in China, so we're thrilled with the prospect of bringing the brand's first ever theatrical release to cinemas in the region in early 2019. We've worked closely with Alibaba Pictures to create content and cinema-themed merchandise with special cultural significance that will resonate with Chinese audiences. We look forward to delighting Chinese families with an unforgettable cinema experience when the film opens next year." The original Peppa Pig animated television series premiered in the U.K. in 2004 and was created by Astley Baker Davies. The series is a favorite among young children around the globe, and the show has been broadcast in over 180 countries. Peppa Celebrates Chinese New Year hits Chinese theaters on February 5th, 2019. There is now word of an American premiere at this time. This news was originally announced by The Hollywood Reporter.